Starring Russell Crowe as Ben Wade (the bad guy) and Christian Bale as Dan Evans (the good guy). 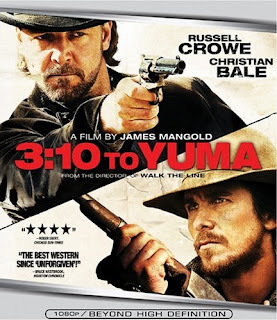 3:10 to Yuma illustrates the impracticality of moral uprightness. The fates of Ben Wade and Dan Evans shows us that it pays (from a worldly perspective) to be evil. Ben reaps the benefits of his lying, cheating, stealing and killing. Meanwhile Dan dies attempting to resist these things. Ben may have boarded the train to Yuma, but he'll get back to his old life of luxurious crime before long. As payment for keeping his word and getting Ben onto that train, Dan receive more hardship and a premature death. Several men tried to bribe Dan into forgetting his promise, but he choose to follow his conscience instead. He swears against all forms of bribery after the government paid him to forget his war wounds. The government paid him so they could walk away, Dan explains. He knows from experience that money compensate for the things that are most valuable. Therefore, instead of accepting a sizable payoff, he decides to face a whole town full of greed and injustice. Dan makes the only choice there was to make: He follows his conscience. There's no living in this world if you're dead to your conscience. What did Dan stand to gain by taking the money? He might have been shot and robbed by the same men who paid him anyway. What's more, had he lived to see his farm again, he would have ruined his son by teaching him to turn a blind eye to lawlessness. Dan's stomach told him to take the money, but his conscience said otherwise. It would have been great to live a few more years, maybe teach his son about running a farm. But he chose the best option by dying before he would compromise. He gave up worldly comfort and security in favor of an unfading riches, which amount to eternal comfort and security. He left his family a better legacy than money could ever buy. I'm not sure Dan Evans is that high and mighty as far as principles is concerned. I think he could best be described as a man who didnt have the courage to be a Ben Wade. There're two kinds of good people in this world - one by choice and the other with no choice. I think Dan Evans is of the later kind. I loved this film though. It was my personal favorite of last year, and in Bale and Crowe, we've two of the most overlooked performances of the year. One of the greatest westerns ever, and certainly the best since Unforgiven. Two of the great characters in recent cinema. I'm not sure on that, because of that scene where Ben beats Dan down, and Dan choking, blurts out his predicament. Look at the pleading look in Dan's eyes. Look at Wade's, emphatizing. I think Dan isnt much of a winner in his own eyes, yet he has to prove this one time to himself, his wife and most of all his son. He says -"Nobody can think less of me." He sees this as his chance for redemption, not proving himself. Many people have criticised the ending. I think it is a great one, for the simple reason stated above. There was no way out for Dan. He had fallen in his own eyes for pleading Ben to help him get on the train. This is definitely one of my favorite westerns out there. Has a good message at the end about sticking it out even when you might die.